Just 26 beach bungalows, housing a total of 80 rooms, are settled in the tropical gardens of our Praslin accommodation. Rooms all have their own private wide wooden deck and double sliding doors that open out onto wide panoramas of the gardens and the beach. Every room is just seconds from powder soft white sand and warm turquoise ocean. 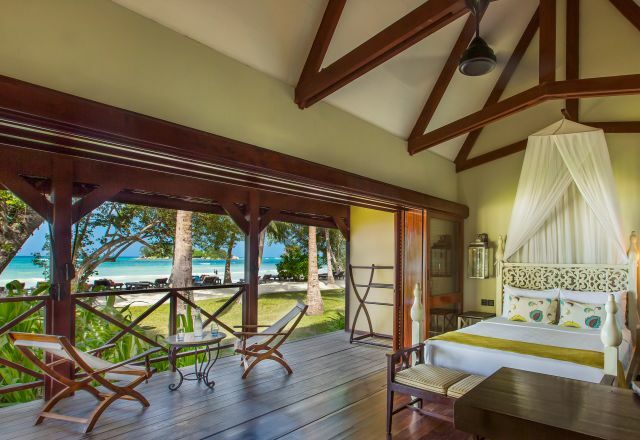 The French-Creole inspired bungalows at our Praslin resort hotel happily marry charming details like wooden floors and shutters with wrought iron edged mirrors, cool ceramic tiles and exposed granite walls. High ceilings with fans and air-conditioning ensure degree-perfect comfort for afternoon naps or long uninterrupted sleep in comfortable king or queen sized beds. Modern touches like unlimited WiFi and a flat-screen TV are some of those nice-to-have home comforts in all our Praslin accommodation. 70 rooms are our Superior Room option, each featuring a king size bed, shower, a separate dressing room with mini-fridge, electronic safe, a dressing table as well as a bathroom with large glass walk-in shower, bidet, toilet and Yi*King spa amenities. A large veranda at the front can be screened for more privacy and is furnished with deck chairs. 10 Deluxe Rooms feature queen size beds and have all the amenities of our Superior Rooms along with a lounge area and sleeper couch that can sleep two small kids under 12 or even a third adult. Bathrooms in our Deluxe Rooms feature a shower and rolltop bath, a double sink vanity and a separate toilet. All our Deluxe Rooms are in our single-story French-Creole bungalows and seconds from beach. The design of our bungalows is in the classic French colonial inspired Creole style. High pitched roofs, large double doors and wide spacious verandas make the most of natural ventilation and make it easy to enjoy the outdoors with privacy. Every room blends into the gardens with colours that complement the palms and features that are inviting and charmingly ‘Seychelles’. Sleeper couch – two kids under 12 stay for free! Need a little more time to check out? Talk to us about a late check out and we’ll do our best to accommodate. Of course, guests are welcome to let us look after your luggage while you enjoy the beach or one-last-swim before your flight or connection back to Mahé. 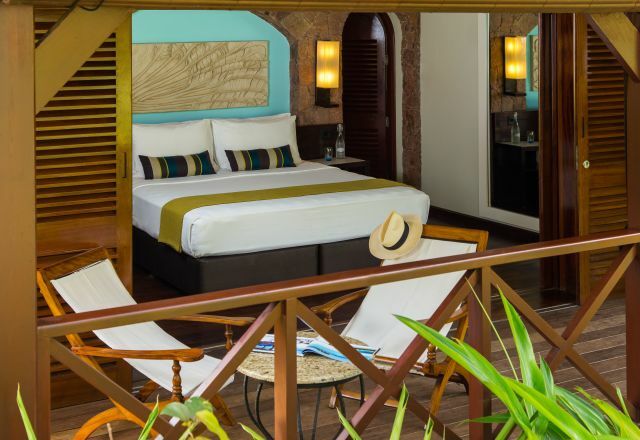 Our Deluxe Rooms offer luxury Praslin accommodation with extra space and amenities.